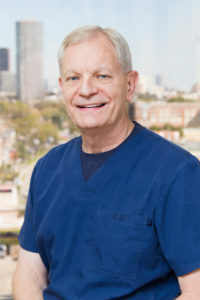 A true commitment to patients’ needs has kept Dr. John Cook practicing dentistry in Houston for 30 years. Dr. Cook has been treating a majority of his patients for 20 years or more. Patients claim his gentle and caring nature, along with his wonderful staff keep them coming back year after year. Recently, Dr. Cook relocated his practice to the Green Bank building at 7500 San Felipe Street. The new office provides patients a state-of-the-art dental environment featuring a wide variety of special services including the latest advances in all porcelain crowns, porcelain veneers, “ZOOM” in-office bleaching, cosmetic bonding, and tooth-colored fillings. John M. Cook III, D.D.S. – A member of the American Dental Association and a Fellow of the Academy of General Dentistry, Dr. Cook is a graduate of Texas A&M University. He earned his dental degree at The University of Texas Dental Branch in Houston. He is a private practitioner treating the whole family, but specializing in cosmetic, implant, and restorative dentistry.